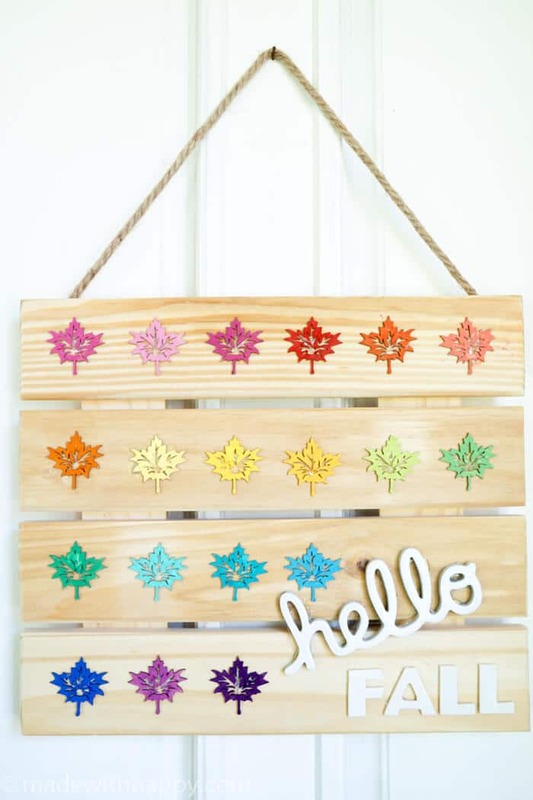 Looking for a fun and festive Fall DIY sign, then look no further! Thank you Hobby Lobby for sponsoring this post. 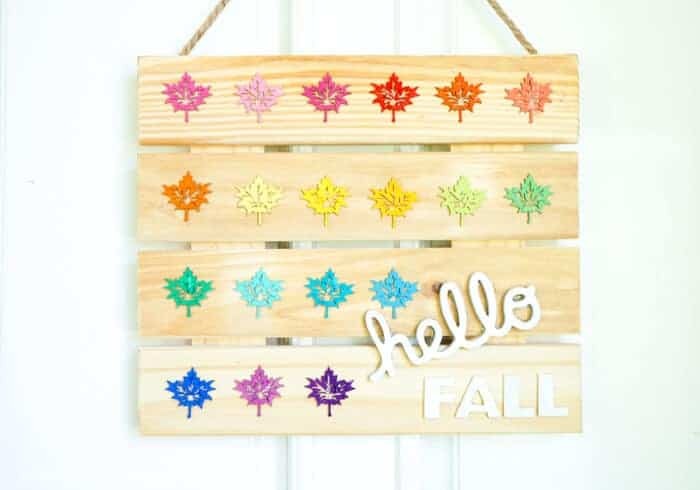 It is always hard to say goodbye to Summer, but man do I love saying hello to Fall. Fall is such a great transition season from the lazy sun-kissed days of Summer before heading into the cold gloomy days of Winter. Back to school, boots, Fall leaves, and Halloween are just some of favorite things happening in Fall, but if I’m going to be honest, my absolute favorite thing about FALL is all the changing colors. When I start to see the leaves change, I feel like I just get all the warm and fuzzies and dream of days laying in the leaf piles. The only challenge I have with traditional Fall/Autumn decor is that they are all made with oranges and browns. If you have spent any second of time on Made with HAPPY (like you are right now) you will quickly realize that I cannot function in a two color world. 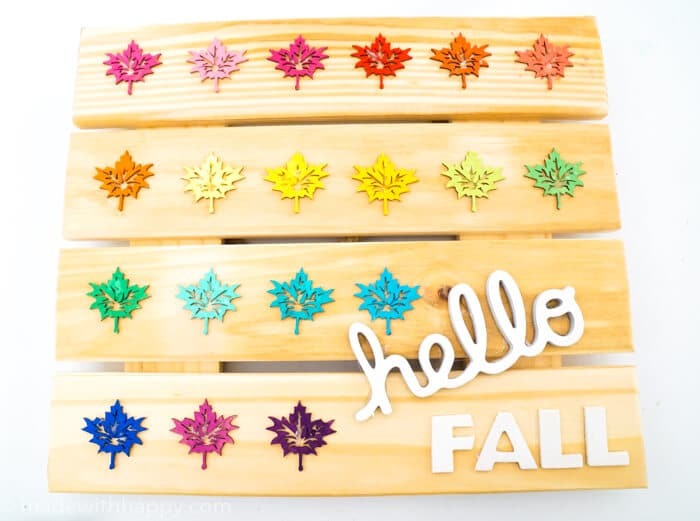 Especially if one of them is brown 🙂 This has led me down the path of creating my own Fall sign that still celebrates the colors changing, but in a brighter and HAPPIER way than the traditional Fall DIY Signs. Head down to your local Hobby Lobby store and pick up all the supplies. 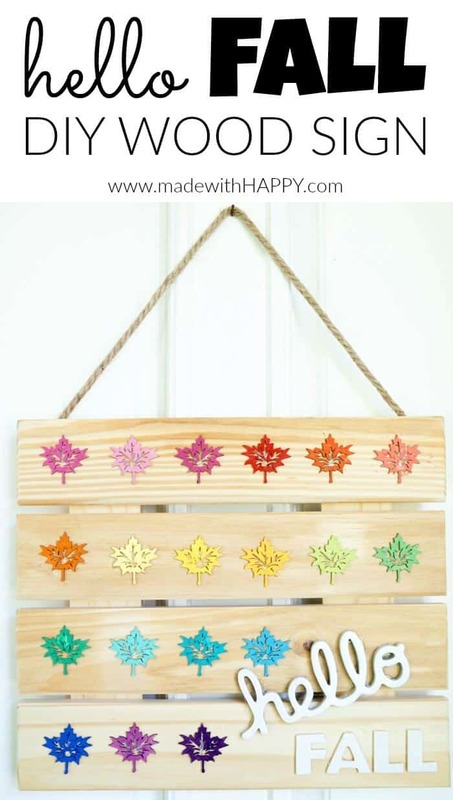 Start by layout your cutouts on your pallet sign to visually see where they all would fit. 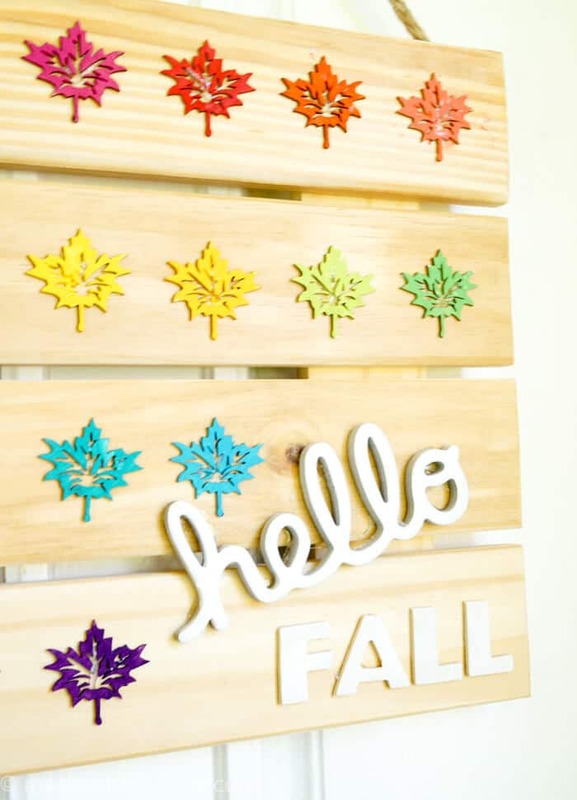 Paint each of your leaves as well as your hello FALL cutouts. 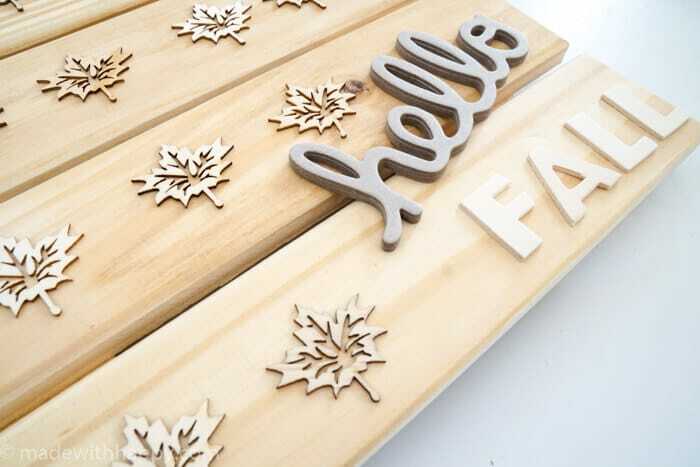 Once they are dry, glue them onto your wood sign. 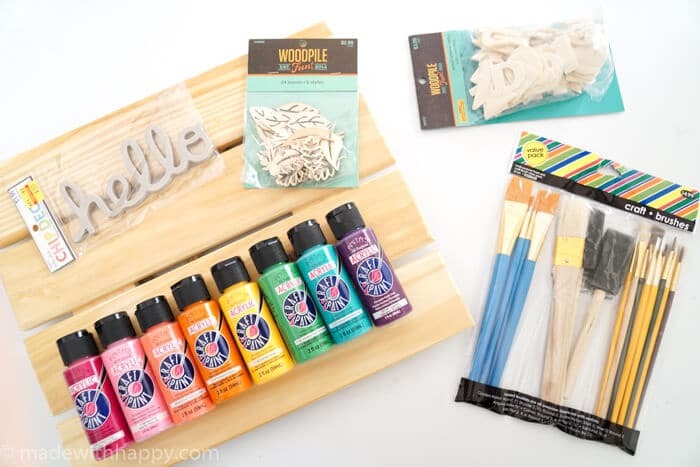 This project makes me so HAPPY because it’s a great way for you try your hand at being crafty and creative, but is so simple, it’s hard to mess up. Those are the best kinds of projects in my opinion. There are a few other ways to vary up this project too. 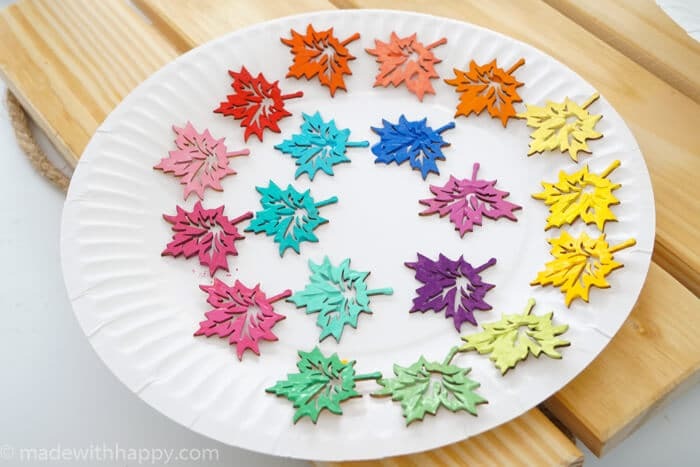 Vary the color of the leaves to your houses decor and color. However, you decide to change it up, we hope you enjoy it. 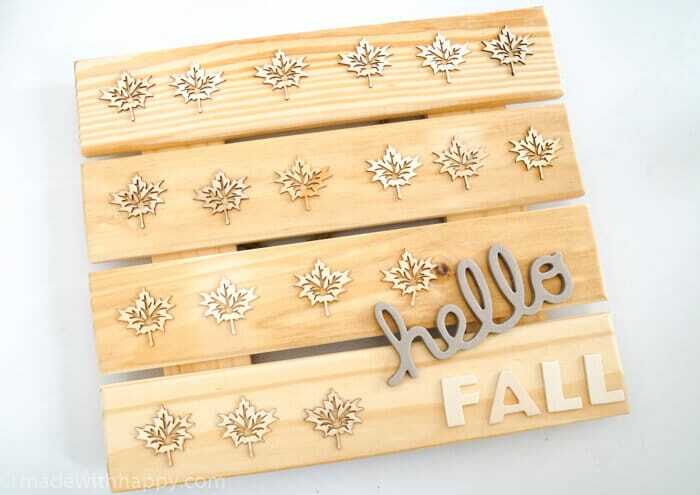 HAPPY CRAFTING AND HAPPY FALL!